The first killer whale intended for a marine park was caught in 1961. "Wanda," age 7, died two days later. In 1964, the Vancouver Aquarium sent out a whale hunter with orders to kill a whale for use as a sculpture model. The 5-year-old whale, later named "Moby Doll," and his pod fought so valiantly that the impressed aquarium director changed his mind and ordered the severely wounded animal brought back alive and put on display, where he survived only three months. Since then, more than 200 whales have died, many within a year of being captured. Capturing killer whales is a bloody and horrific endeavor, according to David Kirby, author of "Death at SeaWorld." Upon spotting a pod of whales, the hunters surround it, drop drift nets into the sea, pick off the youngest whales and drag them away from their pods. Pods develop incredibly strong social bonds and, when forced apart, their suffering is evident in their cries, shrieks and wails. The Marine Mammal Protection Act mandates that whales be captured humanely, but Ric O'Barry, an expert in the field of marine mammals, says that's not possible. Many whales die within a year of being captured, suggesting stress and poor animal husbandry skills are to blame for their deaths. Dr. Naomi Rose, an outspoken marine mammal advocate, contends that placing an orca in a cement pool renders the whale both deaf and dumb since its echolocation skills are thwarted by the concrete. The sound waves, instead of traveling through the water, bounce off the walls. Furthermore, there are no enhancements such as fish, algae, reefs or other "texture" they can use their echolocation to detect. Orcas are placed in holding pens and must learn to get along with animals from other pods. Aggression among strange whales also contributes to captive orca mortality rates. Putting an orca in a concrete pool is like keeping a human being in a bathtub, according to Ric O'Barry, former "Flipper" trainer and producer of the award-winning movie "The Cove." Whales are highly social, more so than people, he says, and when forced to live in captivity their mental and physical health quickly deteriorates. In the wild, whales travel up to 100 miles a day with family units that stay together forever. 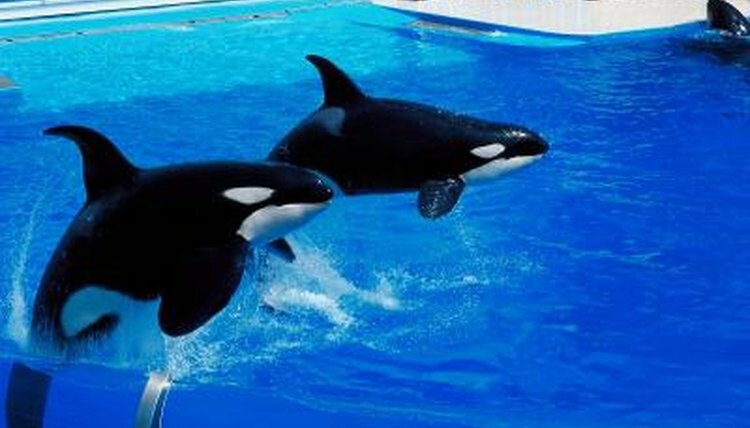 In captivity, 60 to 90 percent of orcas develop dorsal fin collapse, a pathology directly related to confinement. In her 2011 report "Killer Controversy: Why Orcas Should No Longer Be Kept in Captivity," Dr. Rose reported there has never been a documented report of a human being killed by a wild orca; four people have been killed by captive whales. Orcas at sea live 30 to 50 years; captive orcas, much less. SeaWorld, a corporation that owns roughly half of the world's captive orcas, has, on average, lost one whale every year for the past 25 years -- most were under 25, and some were younger than half that. Captive orcas die from the stress of boredom, depression, bacterial infections, tainted food and aggression between animals. Has a Whale Ever Jumped on a Ship?